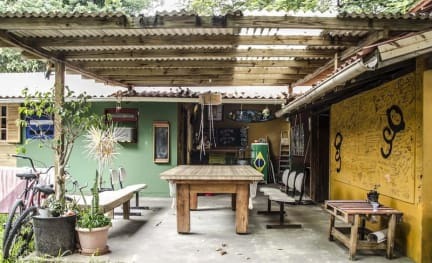 Sagui Hostel i Florianopolis, Brasilien : Boka nu! 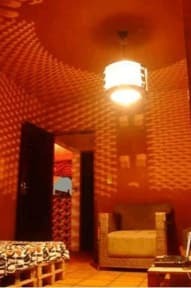 Hostel created to welcome travelers from all around the world in a simple, but cozy and very comfortable house. We opened our doors in July 2013 after a very bad experience in a hostel in Uruguay, hoping to offer the best treatment and give to our guests the perfect environment to share their background and make new friends. We are in the middle of the nature, with a nice yard, 500m away from the beach, the biggest dorm is really spacious and in the outside area we have our barbecue and snooker. We have a nice and cozy TV room with cable TV, library and some music instruments; our shared kitchen is fully equiped; there is the snooker table in the barbecue area from where you can access the patio; Nets on the porch for rainy or lazy days; free computer and wifi available for guests; paid laundry; free parking; samba parties in the hostel occasionally! We are in Campeche beach, the most famous one in south Florianópolis. The beach is 500mts away from the hostel and the landscape is astonishing and preserved. The bus stop, a small grocery store and the drugstore are on the corner. The main neighborhood avenue is 600mts far from the hostel where you can find all facilities (supermarket, bakery, shops, restaurants). We are close to the most famous tracking and parties (a bus or taxi ride), and two connected buses take you downtown in few minutes. If you want to have the best experience in Florianópolis, if you like nature, sports, parties, making new friends and feel at home, you have found your place. We are here to give you the best treatment and help you to enjoy your stay at most! If you have to cancel your booking, you must do it at least 48hrs before arrival.